This article was published by ComputorEdge , issue #2723, 2009-06-05 , as a feature article, in both their PDF edition (on pages 21-31) and their website. From the perspective of the online merchant who is trying to decide which one — or which set — to offer to customers, each choice naturally has some advantages over the other. For instance, PayPal has no setup fee (at least for the Standard plan), but charges a sizable percentage of each transaction. Authorize.Net charges only $.10 per transaction, but also levies a setup fee, a monthly payment gateway fee, a merchant account monthly statement fee, and a merchant account transaction fee. 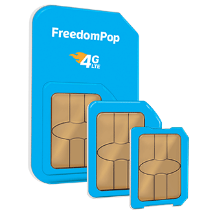 It is certainly not always clear which of these providers, if any, offers the best combination of features for the price, given any particular merchant's needs. However, there is an alternative provider that, in the future, may increasingly challenge some of these better-known gateway services, and in this article I will explore the basics of how to get started accepting payments for a Web-based business. iTransact is a relatively small, privately-held company, located in Bountiful, Utah. Although it lacks the size and history of some of the major players, it has been providing payment acceptance services for online and brick-and-mortar businesses internationally since 1994. In fact, the firm notes that it was the first provider of online check acceptance. iTransact currently supports over 20,000 merchants worldwide. A merchant account with iTransact offers many features: They allow the merchant to accept all major American credit cards, plus electronic checks. It combines a payment gateway and a merchant account, reducing cost and complexity — unlike most payment gateways, which require you to pay for a separate merchant account. iTransact supports recurring payments (i.e., subscription billing) at no extra charge. Their "split-form connection method" allows SSL-level security without your having to purchase a certificate for your site. iTransact is supported by 50 shopping carts, including their own free, simple cart. iTransact is certified with Visa's Cardholder Information Security Program (CISP), and complies with the Payment Card Industry (PCI) Data Security Standard. The firm offers a full suite of fraud controls, at no extra charge: You can screen transactions by address, ZIP code, CVV code, IP address, transaction size, timeframe since a decline, and CAPTCHA. They also provide free customer support via phone or email, by a staff member — not an agent, reseller, or telemarketer. If you sign up with iTransact, then when you login to your account from the company's home page, you will first see a pop-up window referred to as the Merchant Login Panel. In the screenshot shown above, the gateway ID has been redacted, for privacy reasons. It is best to not reveal your gateway ID to the public. More on that in a moment. When you click the button to open the control panel, you should see a display similar to the screenshot below. I will not cover all of the options, but the most commonly used ones are discussed below: account settings, transaction listing, and form wizard. Within the account settings panel, the first three sections are fairly self-explanatory. The fourth section, titled "Advanced Features", contains an order form UID. It is a lengthy string of alphanumeric characters, and can be used in the HTML forms on your Web pages, in place of your gateway ID, for greater merchant security. 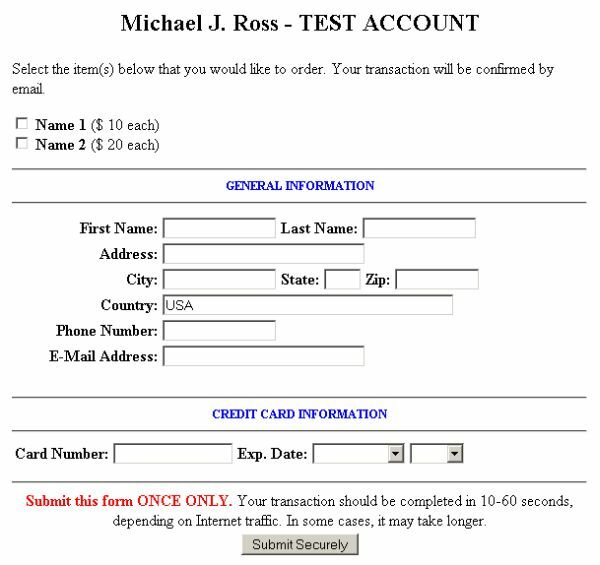 The next section, "Test Transaction Settings", is extremely handy for testing new or modified transaction forms on your e-commerce site. (This is the iTransact closest equivalent of PayPal's "sandbox" development environment.) Be sure to disable this option when you are ready to open your online store for business. All of the settings in the other sections can, for the typical merchant, be left as is. 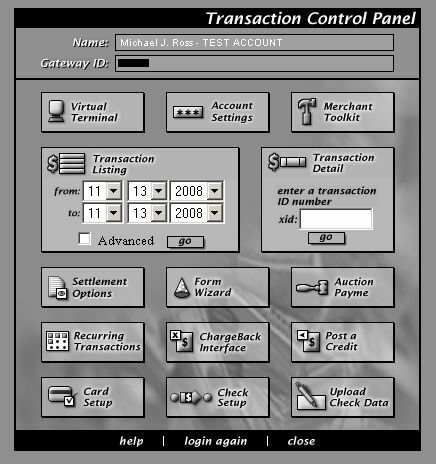 In the control panel, one of the most commonly used capabilities is the Transaction Listing dialog, which allows you to specify a date range, and displays all of the transactions for your account that took place during that time interval. In the screenshot below, you see a sample listing. (It may be difficult to read, as a result of the image width restrictions of this publication. But you get the idea.) For each transaction record, the listing shows the transaction date and time, ID, action, status, payment type, customer name, etc. The dialog also offers an advanced transaction search, which allows you to limit the listed transactions by specific transaction type, action, payment type, status, card type, last four digits of the credit card number, etc. — in fact, every single datum that comprises a transaction record. All of the features already mentioned would be of little value if it were prohibitively difficult to add a form or button to any of the pages on your e-commerce site, such as the customer checkout page. 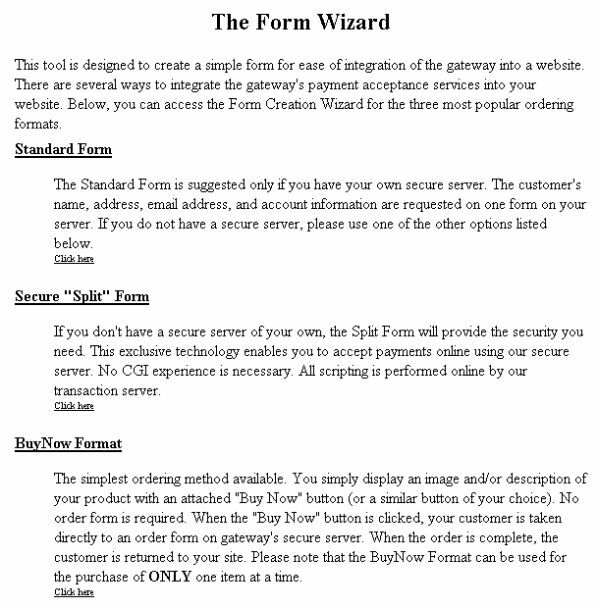 iTransact's form wizard allows you to easily create three different types of forms: standard, split, and BuyNow. As explained in the screenshot above, a standard form is most appropriate for merchants who have an SSL (Secure Socket Layer) certificate on their site, which makes it possible for a customer to have a secure connection between their computer and your Web server (usually indicated by a yellow padlock in their browser). If you plan on doing any significant volume of transactions in your online store, it is definitely worthwhile to pay for such a certificate. If, for whatever reason, you choose not to purchase such a certificate, or you are locked into a hosting service that makes it impossible, then you can still accept customer orders securely, using Split forms, as noted earlier. Lastly, you can create a BuyNow button, which is almost identical in functionality to PayPal's well-known BuyNow buttons. iTransact's buttons are the best choice when your particular product or service is sold as a single item, as opposed to online stores where customers are putting multiple items into their shopping carts, prior to checkout. Let's step through the process of creating a sample standard form. 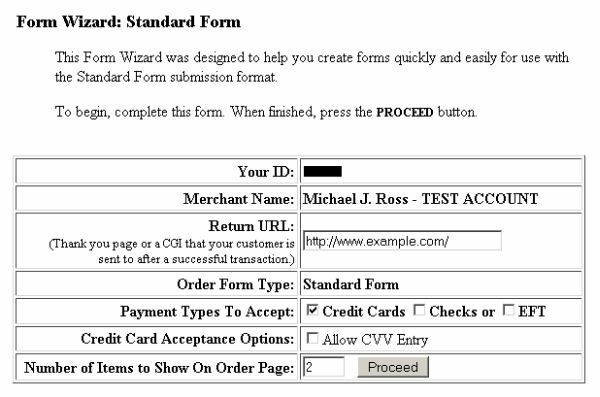 Begin by clicking the "Standard Form" link on the Form Wizard page shown above. The first step is to decide where you would like the customer to be sent after they have made their purchase on the iTransact server. Most merchants will create a simple "thank you" page to inform the customer that their order has been received. Next, decide what type of payments you wish to accept from customers. This defaults to whatever you have specified in your account settings. In our example, only credit cards are accepted. Also specify whether you want customers to enter in the 3-digit CVV code, usually found on the back of their credit cards. Lastly, specify how many products you want to list in the standard form you are creating. In the second step, you type in the name and unit price for each of the products, as well as which of the three format choices you want (A, B, or C — described in more detail in the iTransact documentation). 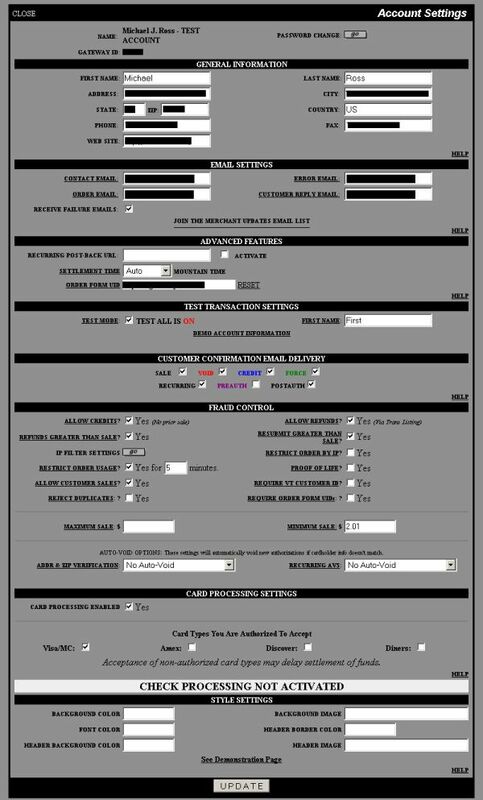 In the third and final step, the page shows what your standard form will look like to the customer (aside from any additional styling that you do to the page in order to integrate it into your site's appearance). You can use the HTML of the form displayed, as is, or you can copy the <form> HTML element into any of your site's pages. If you have any questions as to the usage of any of these settings, you can read the online documentation, or ask your iTransact representative. All of the documentation can be found on the support page, including toolkits for merchants and developers, sample code, and additional information. Unlike most if not all of the other payment service providers, iTransact assigns you a specific representative, so you don't have to explain your business and e-commerce needs every time you have a question. Speaking of which, I would like to acknowledge the assistance of Rich Lane for his assistance in providing business information for this article. 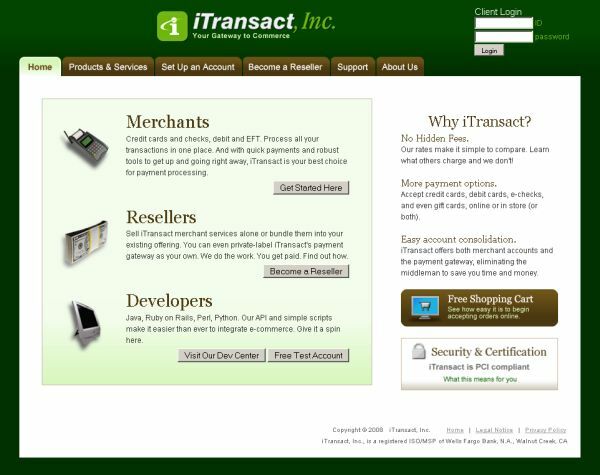 Anyone interested in learning more about how iTransact can be used on their own e-commerce site for accepting payments from customers, can contact Rich at r.lane@itransact.com. Even though this article can only serve as an introduction to iTransact, perhaps it is enough to provide current and future online entrepreneurs a good idea as to how well iTransact could serve as an alternative to the larger and more costly payment gateway services. Your site looks great! I like the estimated cost feature. Pretty snazzy!